Temperatures will be in the 90s across much of the East Coast. 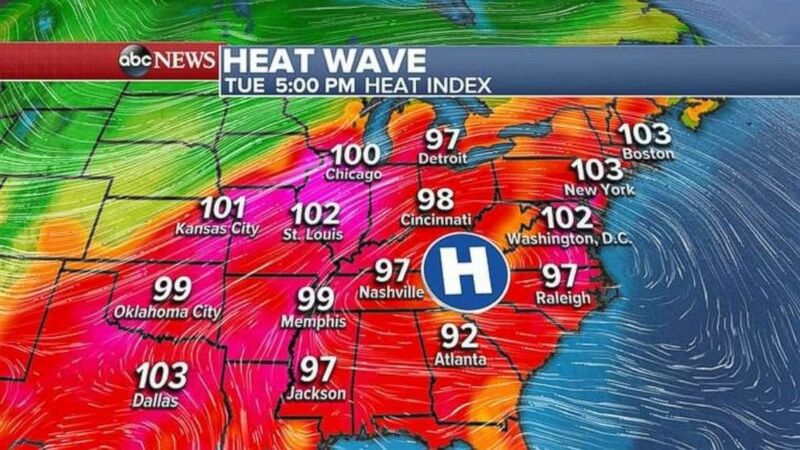 There are 17 states from Missouri to Maine under heat advisories and warnings on Tuesday as temperatures over 90 degrees continue for another day. With humidity, it will feel like over 100 for millions of people. (ABC ) Areas between New York and Chicago are forecast to see triple digit temperatures this week. The core of the heat wave will move into the Northeast by Wednesday when it will feel as hot as 105 degree in Philadelphia. 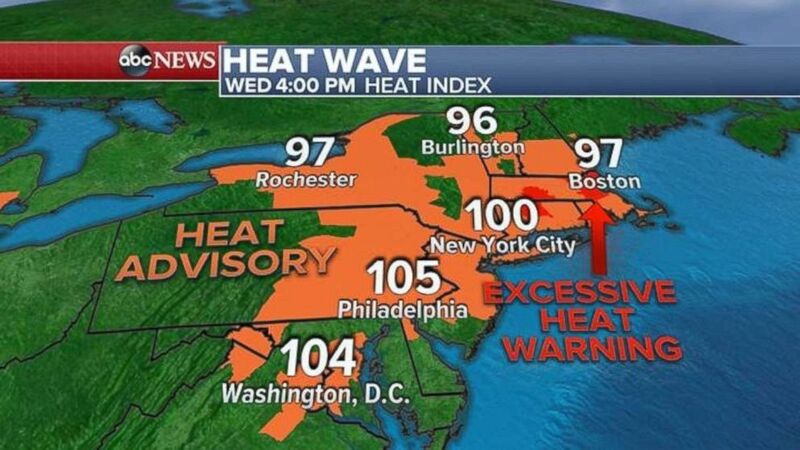 An excessive heat warning has been issued for Boston and Hartford, Connecticut, on Wednesday. (ABC) Parts of the Northeast were under excessive heat warnings this week. The heat wave will begin to break by Thursday and Fridayas much cooler weather moves in this weekend. 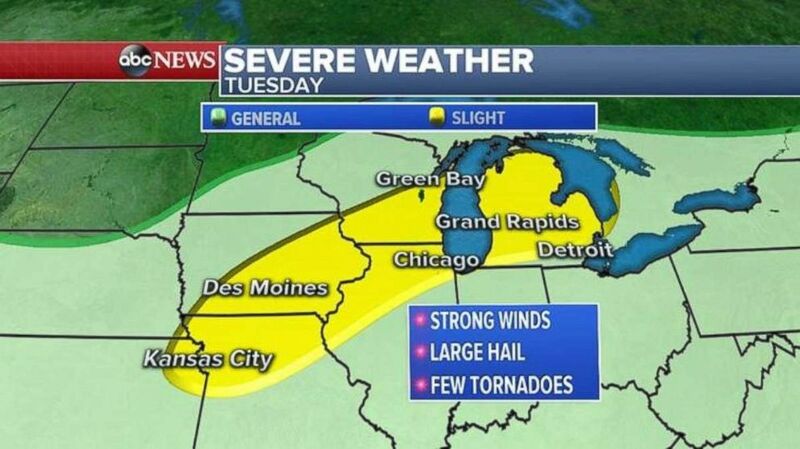 A cold front responsible for all severe storms in the Midwest on Monday will move slightly east and south Tuesday and stretch from Kansas City, Missouri, to Des Moines, Iowa, and from Chicago to just north of Detroit. The biggest threat with Tuesday’s storms will be damaging winds, but also we can't rule out large hail and an isolated tornado or two. (ABC) Multiple areas of the US were under severe weather watches on Tuesday. 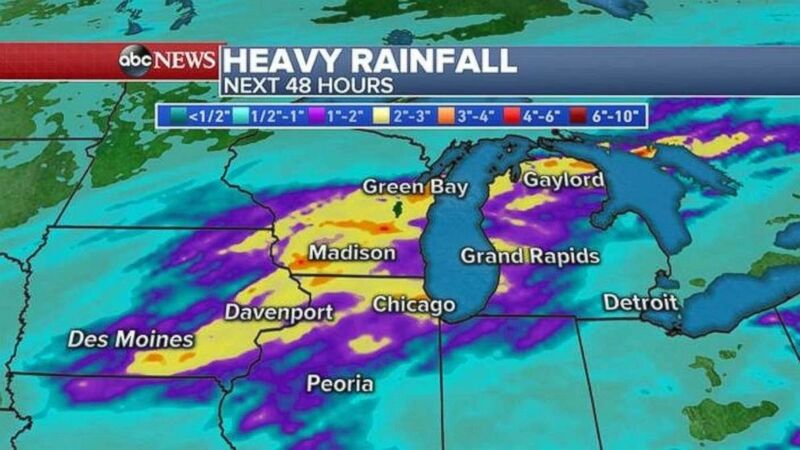 As the storms continue to pass over the same areas through Tuesday and into the night, more rain is likely for already flooded areas in the Midwest and the Great Lakes. Some areas could see an additional 2 to 4 inches of rain. River flooding and flash flooding is possible over the next 24 to 48 hours. (ABC) Parts of the Midwest were under flash flood watches on Tuesday.